Casey Gwinn, "Mr. Domestic Violence"
Watch the above video before reading the last letter sent to Gwinn (below) when he was San Diego’s City Attorney. Notice that his public persona shown in the video pretty much replicates his beliefs of ten years ago. Notice that in the video he still defers to “abused women” rather than the all inclusive “victims”. Casey and I have had several conversations over the years and I know he knows better. The last I heard Ms. Strack while teaching at a local law school still uses an antiquated text book absent contemporary evidence based information about domestic violence — evidence, a plethora of which, clearly and irrefutably establishes that domestic violence is not gender specific; evidence that emphatically establishes that just as many men are abused by women, if not more, than women are abused by men. Of course, most of you know that. So, why don’t influential experts like Gwinn and Strack? You tell me, please explain it, because I really don’t know why our culture puts up with. 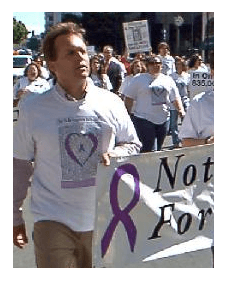 After reading the Letter to Casey Gwinn January 2002 you might watch the video again while pinching yourself just to make sure you are really alive and not just some leftover piece of junk kicking around inside a bad dream. Like the taxpayer funded, domestic violence industry, this "newscast" (propaganda) doesn't recognize male victims of domestic violence, and it does not recognize all the false accusations of domestic violence that women make. This kind of "newscast" (propaganda) appears to be lying with intent to deceive. It appears to me that such disingenuousness contributes to "Witch-Hunting Males" as shown in the video of the same name at Youtube. This misandrist "newscast" (propaganda) does not deserve to be shown in America and contributes to the harm done to male victims of domestic violence and domestic violence law as shown in "Los Misandry" at Youtube, IMO. What these man-haters don't seem to get, is it hurts women and children too. The more we hear about how much women can benefit from the system as it is, how it can be abused to such a degree, even by the women doing the abusing, the less and less the male victims will believe they can get help, and the less options they will feel they will have when they have finally suffered enough. When these men hit their limits, and they have nowhere to go, nobody to help them, and a system that will treat them as criminals simply at the abusive woman's say so, they are going to take one of the only two options available, their own death (which hurts their children emotionally and financially, not to mention leaving them in the hands of an abusers) or that of their abusers(which obviously hurts the woman, but also the children), or more often then not (I suspect), both (which just hurts everyone).